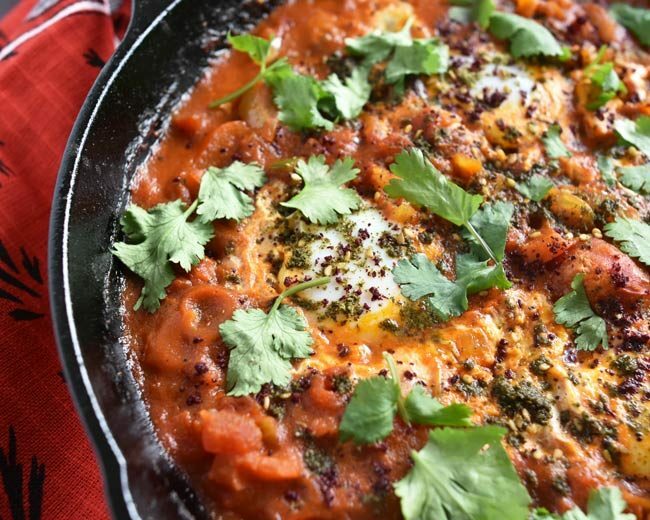 This shakshuka recipe will be a new favorite in your meal plan rotation. Are you a fan of Middle Eastern and North African flavors? Then you’ll love this shakshuka even more. This post is part of a group called Progressive Eats, a virtual version of a Progressive Dinner Party. This month is hosted by Carol Borchardt, the founder of the blog From A Chef’s Kitchen. We’re featuring dishes prepared with eggs, especially timely with Passover and Easter around the corner. Be sure to check out all the delicious recipes at the end of this post! When my kids were younger, we ate breakfast for dinner at our house frequently. 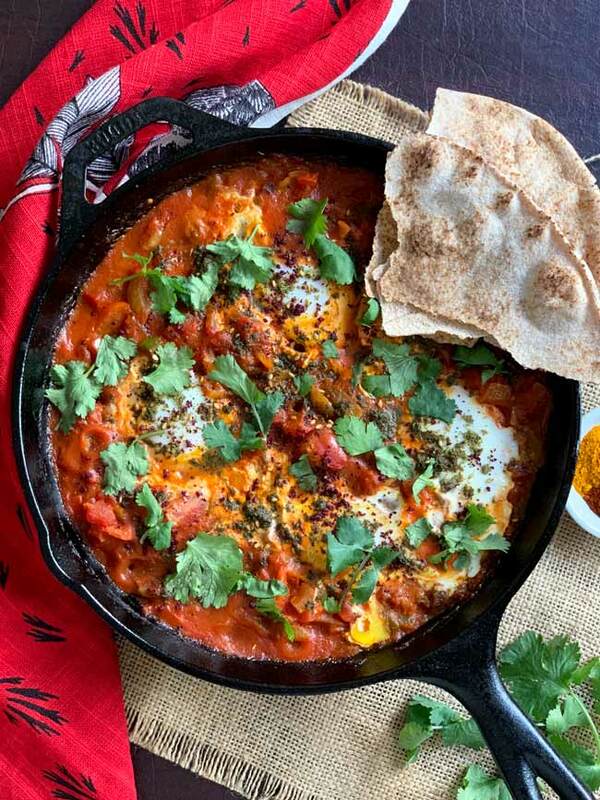 In 2013, I took a deep dive into Middle Eastern ingredients and soon discovered a new egg recipe called shakshuka (sometimes spelled shakshouka). Eggs are poached in a savory, soul-satisfying spicy red tomato sauce base. It’s simple but this shakshuka recipe is infinitely flexible and works for any meal of the day. Shakshuka (say it three time fast) is of Tunisian descent but has also become a very popular breakfast and brunch food in Israel. You’ll find similar dishes in other cuisines. 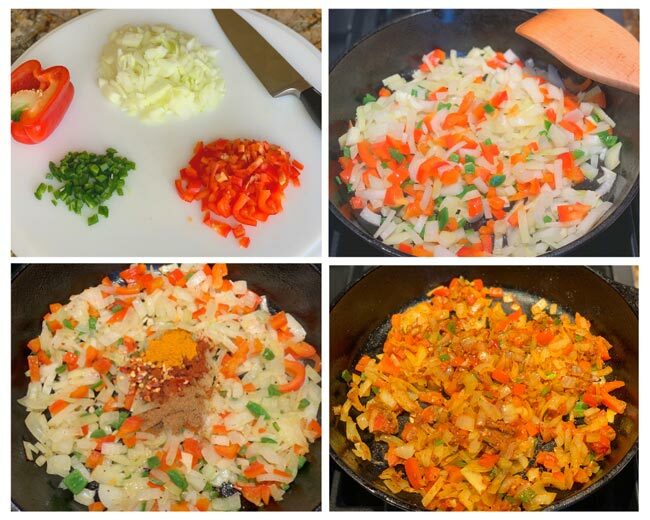 For example, growing up my mom used to make what she called Spanish omelettes – they had a savory tomato filling. In Turkey, they serve a dish called menemen which has many similarities to shakshuka. And I don’t think it’s a stretch to see similarities in huevos rancheros. 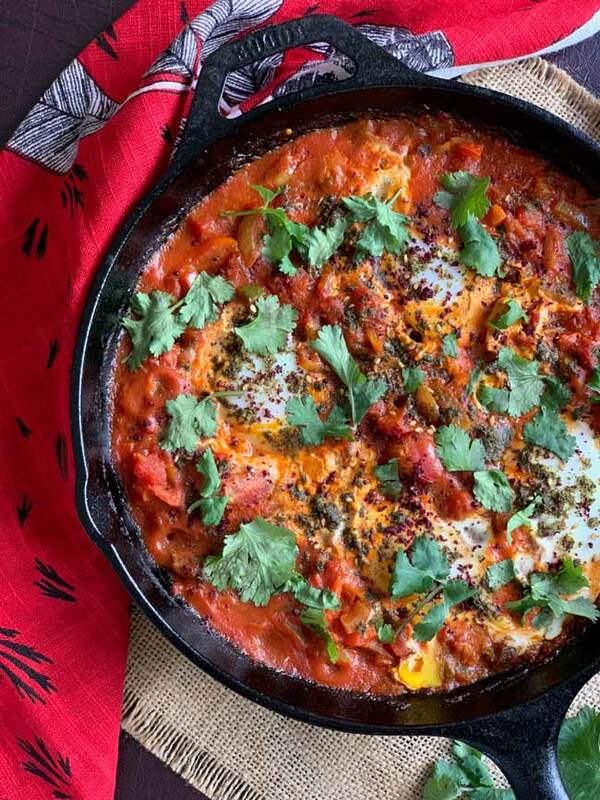 To make this shakshuka recipe, you create a spicy tomato mixture that forms the bed for cooking the eggs. This spicy tomato mixture is called matboucha. Matboucha is comprised of fresh or canned tomatoes, bell and spicy red or green peppers, smoky and/or sweet paprika at its most basic. This mixture comes together quickly on the stovetop, then you make wells for the eggs, add them in, and just wait for the eggs to cook and your meal is ready. Can Shakshuka be Prepared Ahead of Time? Shakshuka could be prepared ahead of time, in part. The matboucha or tomato base can be refrigerated or frozen and then used on demand for a quick meal. If needed, thin the sauce with a bit of water when you reheat. If you have leftover sauce after serving it, reheat the next day and add another egg or two! Traditionally, serve your shakshuka with pita bread for dipping or accompany it with yogurt or yogurt cheese called labneh topped with a bit of olive oil and za’atar spice mix. For dinner, accompany this dish with a nice green salad or an Israeli salad and everybody’s taste buds and bellies will be happy. Can Other Ingredients be Added to Shakshuka? Shakshuka is a blank slate for creativity. Add some greens. Add some meat – lamb is an especially good accompaniment. Add some chickpeas. Sprinkle feta cheese on top. Some people even make a “green” shakshuka with a base of various green vegetables instead of tomatoes. When we were in Tel Aviv in 2017, we went to a very famous shakshuka restaurant called Dr. Shakshuka. 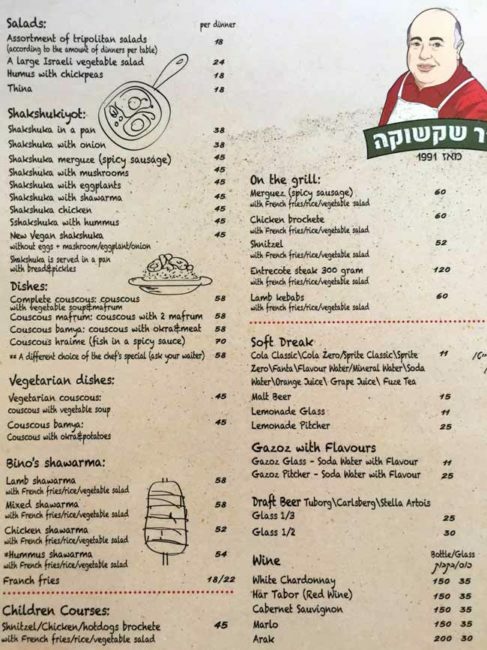 Here is a photo of their shakshuka menu – you can see they have many accompaniments you can order. 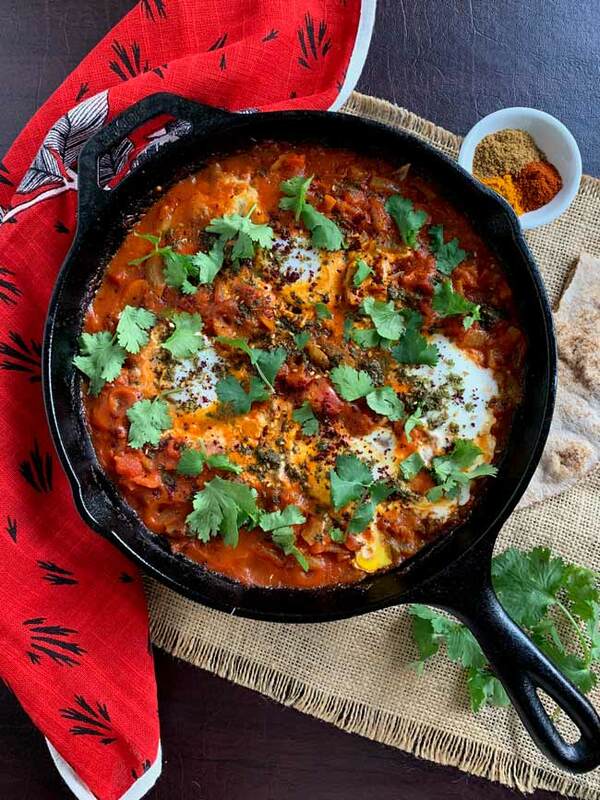 Can you make Substitutions in this Shakshuka Recipe? Use jarred roasted red bell peppers instead of fresh red bell pepper, if you’re out. No whole tomatoes? Used two cans of diced tomatoes. Don’t like it spicy? Leave out the harissa or hot dried chili flakes or be sure to take the seeds and membranes out of the fresh spicy red or green pepper. Want to add more protein or leafy greens? Throw them into the matboucha (spicy tomato base). No pita bread? Use whatever bread you have or skip the bread completely if you are watching your carbs. Loving these North African and Middle Eastern flavors? Then the optional harissa, za’atar and sumac are for you! Harissa, like shakshuka, is of Tunisian origin. It is a spicy condiment, made even more popular by the “Ottolenghi effect” – the rise in popularity of various Eastern Mediterranean ingredients since Yotam Ottolenghi’s cookbooks have grown so popular. You can even find harissa in Trader Joe’s these days. Just test the spice level before deciding how much to add. Za’atar is a beguiling middle eastern spice blend that was my gateway into Middle Eastern cuisine. And sumac (not the poisonous kind) is a ground tart red berry that adds a lemony zing to dishes without adding the liquid of a lemon. You can read more about za’atar here and sumac here. Neither is necessary on this dish but both add a zippy finishing touch if you have them. Gather ingredients and chop vegetables. Saute the onion and peppers until soft and translucent. Add your dry spices and harissa. Let it simmer for 20 – 30 minutes. Carefully add the eggs and cover. When eggs are cooked, take off heat. Top with sumac and za’atar (if using), fresh cilantro (if using) and serve! Love the flavors of shakshuka? Explore the ingredients of the Middle East by joining our virtual cooking community Tasting Jerusalem on our Facebook page or in our Facebook group. This is a versatile dish you can eat for any meal of the day. If serving a crowd with mixed tolerance for spicy, up the flavorful non-spicy ingredients and reduce the hot peppers. Short on time? Prepare the tomato mixture when you can, refrigerate, and then just reheat and add the eggs. Saute the onions and red peppers in the olive oil in a large frying pan on medium heat until the onions are transluscent and softened and just starting to show some color. Add the spices and harissa and combine with the pepper/onion mixture. Pour in the tomatoes, breaking up the whole tomatoes a bit with your hands. Stir and let it cook on low heat partially covered for about 20 minutes, tasting it as it cooks to adjust for seasoning. When the tomatoes have broken down a bit and the flavors are blended, you're ready for the eggs. Make 6 wells or indentations to pour the eggs in. I cracked my egg in a separate bowl and poured it in to ensure no shells. Put the heat on low to medium low, cover the pan and let the eggs set - this should take about 8 - 10 minutes. When the yolk is still soft but the white is just set, you're ready to serve. At this point, you can sprinkle with a bit of sumac or za'atar if you have some and also some fresh chopped cilantro or parsley. Serve with soft bread for dipping. I also served some crisp veggies and labneh (yogurt cheese) topped with olive oil which my daughter used as a dip for the veggies. 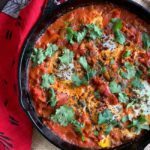 46 Responses to Shakshuka Recipe: An Easy Egg Dish for any Meal of the Day! Wow! This might be the best shakshuka recipe I’ve seen, and I love all the additional information you added. I want to spend some time going through this the next time I make it, and use your recipe and ideas! For example I make my own Harissa, and that would be a great addition. Thanks for all the wonderful information and ideas!!! Oh tell me more about your harissa! Sarene and I developed a rose harissa recipe that we will be posting soon. It’s a very interesting spice paste and of course has so many variations. Shakshuka is a great dish for you to please your carnivore husband and your vegetarian self! This is the best post Beth! So much interesting info and love the quick 7 steps outline. Sharkshuka was new to me a few years back too. I’ll have to try some of the variation ideas from the Tel Aviv menu. Yes and your variations on recipes are always so creative Rosemary. Let’s plan another day to cook or bake together – maybe we can make pita and shakshuka! This shakshuka looks delightful! I love dishes like this, but had no idea of the history of the dish. So interesting! 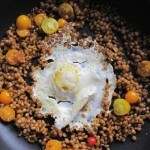 And there are so many examples in other cuisines – it’s kind of a universal idea – tomatoes and eggs! Would you believe I have never made Shakshuka? That clearly needs to change now that I laid eyes on this mouthwatering recipe! The ingredients you used sound simply amazing! Oh and how I would like to see your version of it when you do Carol! Both your flavors and how you would see it through the camera! This is such a great post and such a gorgeous dish! I think lots of cultures have eggs-in-sauce dishes, much like most cultures have stuffed dumpling recipes, whether that’s pierogi, ravioli, etc. Isn’t there some Italian dish of eggs cooked in spicy tomato sauce? Anyway, the way foods travel and morph along the way is always interesting to me. Plus, of all the eggs-in-sauce recipes, shakshuka definitely wins for the best name! My father was Middle Eastern and so I grew up loving these kinds of exotic flavors. How has that influenced your cooking through the years? Aren’t these flavors just beguiling once you try them? 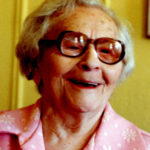 Yay – I am so glad and what a great way to serve it! Beth, I’m a huge fan of shakshuka and love all your tips for how to make it – as you did, or with any of the substitutions. I’m also big on breakfast for dinner and have sometimes been lucky enough to find a container of matboucha in my freezer (though I didn’t know its name until reading your post.) There’s nothing better than having a craving for shakshuka and finding that you’ve already got the tomato sauce and just have to warm it up and poke the holes for the eggs. What a great contribution to this month’s Progressive Eats! It’s a really inspired group of dishes this month – I still need to study each one but at a glance – I am just so impressed with all of us! This is so beautiful Beth, and I absolutely love the alternate flavoring options you give. I love them all and they make this a whole new dish! I recently was introduced to Shakshuka and loved it. That menu from Dr. Shakshuka is fabulous! yours looks amazing. Right – such a fun menu! It’s a crazy place. Worth a visit just for the kitch of it all. It’s my go to for anything. Taught my daughter to cook it so she could impress her college friends. I love the addition of harissa in yours and the red peppers. I am going to try that soon! It’s so versatile and allows everyone to put their own spin on it – a great technique to learn and then expand upon. 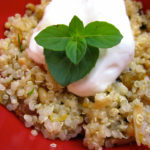 I have yet to make this dish, but now I’m thinking it’s perfect for a meatless Friday during Lent. Such a gorgeous way to serve eggs!! Oh do it Liz – you would make such a gorgeous version I have no doubt! 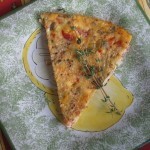 My kids love frittata and quiche! I never had them growing up, so it’s only been in the last year or so that I’ve made them. I am so glad I tried it out. I’ve never heard of this before, but, like you, I’m a HUGE fan of BFD. This looks like a great recipe. Thanks for sharing 🙂 Hope you’re having a great weekend! You too Charlotte. Thanks for popping by! Try this, you’ll like it! BFD rocks! These photos make my mouth water! I’m having eggs for dinner tonight! Probably ALL WEEK! Thank YOU! Eggsellent eggs. Love that you made spicy shakshuka and finally got to enjoy it at home! So glad the Jerusalem cookbook inspired you to make it (and I so appreciate the shout out as well). B’tayavon! I think you may have inspired me more than the cookbook 🙂 You and “jerusalem” are a pretty hard sell on getting into the kitchen to try new things! Sometime soon in Jerusalem, ok? Looks delicious. Wish I could remember having this dish when we were in Israel. However, you are right I am not an egg lover but I must say I would certainly try this one. And that dish in Zero Zero was delish. I do chop some hard boiled eggs with onions and mayo and add a salad for dinner sometime. I can’t believe you didn’t eat shakshuka when you were there! I guess you’ll just have to go back! 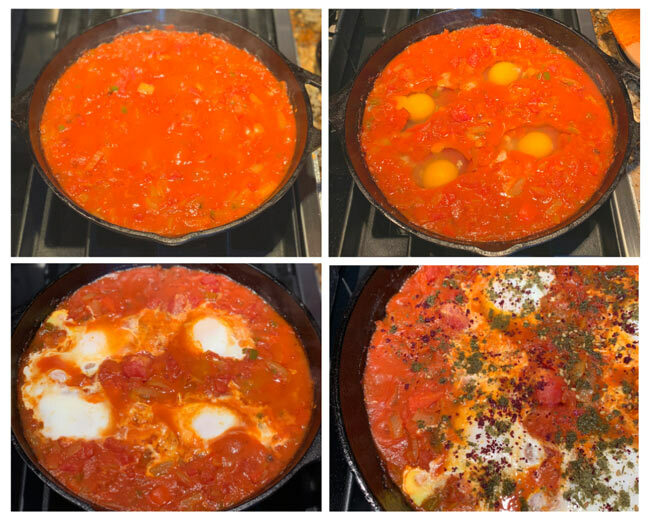 My kids LOVE shakshouka — Reuben learned to love it at camp, when an Israeli scout cooked it for a camp out. Maya loves it from her time in Israel. I’ve never gotten a good recipe, but this one looks like it will be a hit. I love saying the name so much, we should throw a shakshuka party – seems like there could be a dance (come on everybody, let’s do the “shakshuka”), a drink (shaking shakshukas), and of course, lots and lots of the original dish – spicy, not spicy, and everything in between :-). I’ll make it for your kids anytime! This is one of those fabulous pantry meals that everyone always sighs with pleasure over, Beth! Your last photo has me drooling and planning an egg-inspired dinner for tonight. I look forward to trying your version of shakshuka…sounds delicious! Thanks for circling back with a comment after my comment thread was opened back up! I don’t know how that happened. Hope your egg dinner turned out eggsellent – and may we share shakshuka this year in Jerusalem!